This Wi-Fi® enabled Evolution® Connex™ system control, with occupancy sensing ability, knows when you’re gone and automatically sets the system for maximum savings. When you’re home, its intuitive interface puts comfort control at your fingertips through a user-friendly touch-screen design. 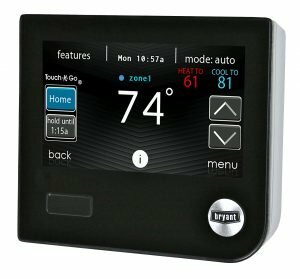 Capable of managing a complete home comfort system including humidity, ventilation and zoning, it is also the brains behind Bryant’s highest-efficiency Evolution products.